It’s a whole new full-back line for Jim Gavin’s men. 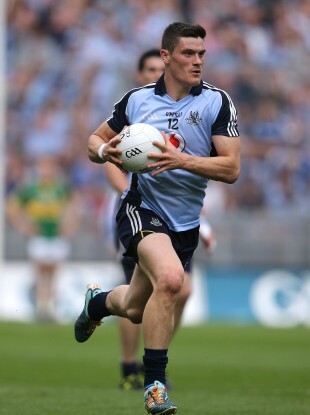 Diarmuid Connolly is back from club duty for Dublin. AS THEY GET set for a rematch of last year’s All-Ireland football final, Jim Gavin has rung the changes by bringing in seven new faces to the team which lost to Derry in the last round of Allianz National Football League Division 1 fixtures. Rory O’Carroll, Paul Flynn and Diarmuid Connolly all make a return to the starting XV to face Mayo with O’Carroll taking his place alongside Jonny Cooper and Darren Daly in a completely revamped full-back line. James McCarthy returns from illness in place of Darragh Nelson, while Tomás Brady will play centre-back. Up front Flynn and Connolly — the latter fresh from his All-Ireland Club victory with St Vincent’s — will partner Alan Brogan while Kevn McManamon returns to corner-forward. David Byrne, Bryan Cullen and Paul Hudson are the three to lose out. Dublin team to play Mayo: Stephen Cluxton (Parnell’s); Jonny Cooper (Na Fianna), Rory O’Carroll (Kilmacud Crokes), Darren Daly (Fingal Ravens); James McCarthy (Ballymun Kickhams), Tomás Brady (Na Fianna), Kevin Nolan (Kilmacud Crokes); Michael Darragh Macauley (Ballyboden St Enda’s), Cian O’Sullivan (Kilmacud Crokes); Paul Flynn (Fingallians), Alan Brogan (St Oliver Plunkett’s/Eoghan Ruadh), Diarmuid Connolly (St Vincent’s); Kevin McManamon (St Jude’s), Eoghan O’Gara (Templeogue Synge St), Paddy Andrews (St Brigid’s). Email “Seven changes for Dublin as big names return for Mayo rematch”. Feedback on “Seven changes for Dublin as big names return for Mayo rematch”.